I’m back! This time with a delicious and easy side dish. 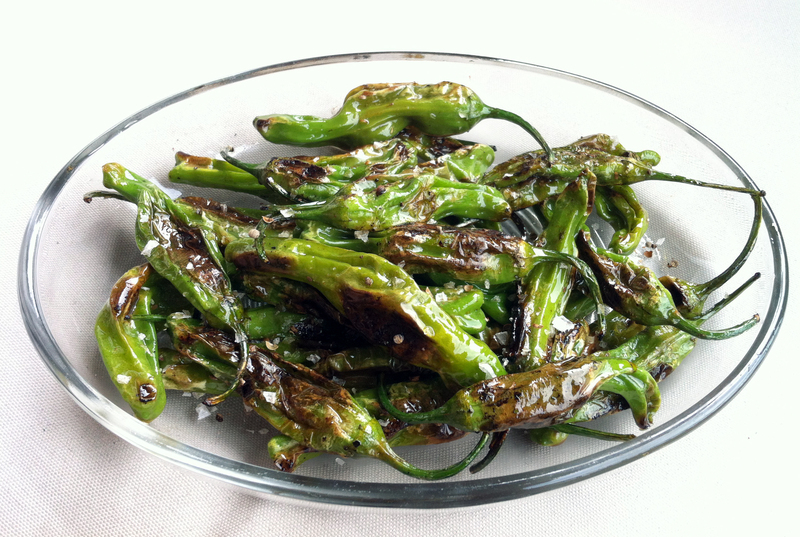 Let me tell you these roasted shishito peppers are addictive! The shishito pepper is mild, some can have a little bit of heat, but it usually mellows out when you cook them. I was inspired by a restaurant in NYC that serves them as a side dish. I thought to myself, I bet I can make these at home. When I went to the farmer’s market this past Saturday I found the Shishito peppers at a farm stand named Bodhitree Farms. Best part is, all of their produce is organic, I always try to find organic produce. Especially for peppers, which are on the dirty dozen list. I love tangy citrus, so I added a squeeze of lime and a sprinkle of coriander salt. My roommate and I are part of a group called BK swappers. It is an awesome group that you meet with about once a month. Everyone brings 5 food items to trade, it can be anything from cookies to homemade pickles. She traded some of her award winning hot sauce for some coriander salt. It is a simple kosher salt mixed with cracked coriander seeds. It is amazing! For those of you that don’t know, cilantro is grown from the coriander seed. It doesn’t taste like cilantro, but is used as a spice in both Mexican and Indian cuisine. It makes the perfect topping for this dish. Start by putting 2 tablespoons of olive oil in your pan. Turn the heat on medium and add a few handfuls of peppers. Enough to cover the surface of the pan, be sure not to overcrowd them. 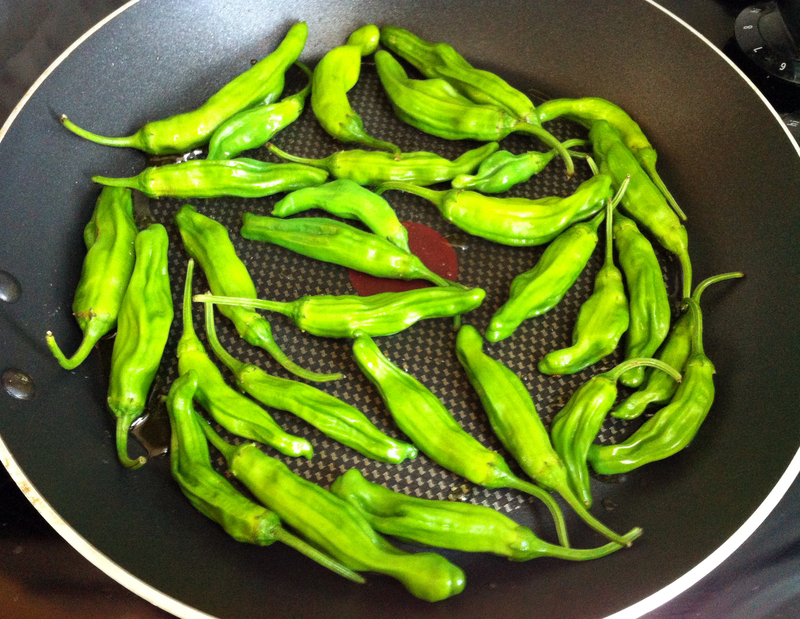 Once the pan starts to heat up, you will want to check and see if the pepper skins are blistering. 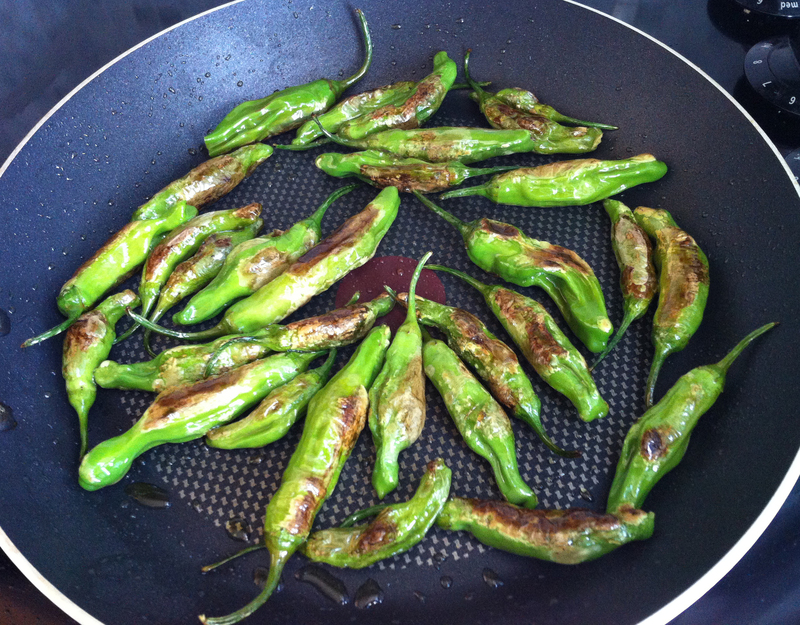 You will want to either turn the peppers over using tongs or toss the peppers in the pan to evenly cook on all sides. This will take between 5-10 minutes. When you are satisfied with the color and texture of your peppers, squeeze the 1/2 lime over the pan and put them in a dish. Sprinkle with a little pinch of kosher coriander salt and you have a beautiful side dish that you will want to make over and over again! I love it! This is one of my favorite things ever. I used to always order them at Ippudo where they come with a little dish of yuzu salt. Addictive! And then I figured out I could just buy yuzu salt and make myself a giant pile at home. YUM! Coriander salt sounds equally amazing. What a great idea the BK Swappers is! Yuzu salt! yum, that sounds so good! You should come to the next swap this coming Thursday 7/26! Oh that sounds so tempting!!!! Your swap sounds fun. You know, your recipes are amongst my favorite. Simple, healthy, sometimes raw. Thanks for sharing what you do.